We've strung twinkly lights outside the shop, we're brushing off our gift-wrapping skills, and every day the delivery trucks bring big stacks of brown boxes bursting with shiny new toys, piles of clever stocking stuffers, cozy pjs and toasty socks, and begging-to-be-loved stuffies. There's no doubt: it's that most treasured time of the year, and we can't wait for you to come bustling in the front door, coffee in one hand and shopping list in the other. Just consider us your elves! Here's a quick peek at some brand new gems we've brought in for the holidays - then it's back to unpacking more boxes! Every December at Fiddlesticks, we're given the best gift of all when bright-eyed boys and girls come in wearing their fanciest frocks and most dapper sweater vests, on their way to the San Francisco Ballet's The Nutcracker. This year we're celebrating this holiday tradition with a one-of-a-kind story book, featuring dreamy, jewel-toned illustrations and impressively engineered sliding pieces that make the book dance to life. 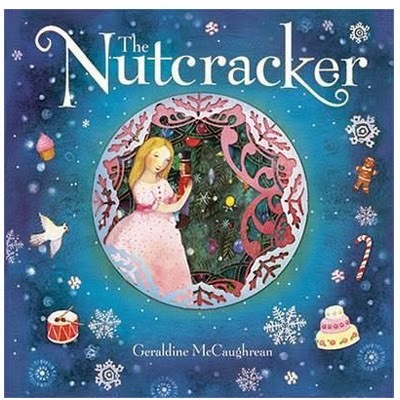 Take a look at "The Nutty Nutcracker Christmas," too: it's the classic story told from a modern-day Fritz's point of view, and will have readers giggling right from page one. Gamago is a whimsical, wonderful world dreamt up in a San Francisco garage, and last Thursday a colorful cast of Gamago critters wandered in the front door and took up residence in our shop; as fiercely grumpy as their Yeti leader appears, they seem to please kids of all ages! For chubby-fingered toddlers, we have a brightly colored, big-pieced mix-and-match puzzle, for medium-sized kids with ginormous appetites we have stacks of color-your-own place mats, and for the older crew, we've got stationary sets complete with woodsy writing sheets, matching envelopes, and quirky stickers galore. 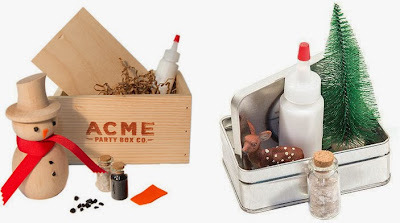 We're always proud to carry local lines, and Mountain View-based Acme Party Box is a favorite. What better way to warm a chilly day than by DIY-ing your very own jolly snowman, or by building a wintry wonderland diorama? (That shiny silver box doubles as the setting for the diorama - genius!) These kits make great gifts for older kids. German toy company Haba delivers some of the best goods on the market, and this one is sure to set hearts fluttering when the wrapping paper is ripped away. 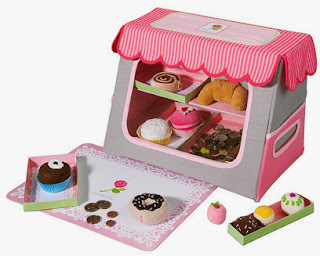 The sugary sweet set comes complete with a display case for your little entrepreneur's new pastry shop. The pretty pastries are ready to be served! Perfect for tea parties and playing with Grandma, too, this set will provide hours and hours of fanciful play. 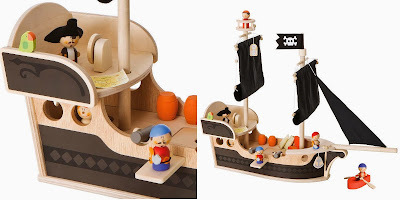 Oh, you know we love a good pirate toy around here, and this one is tops. Designed by Italian toy company Sevi, the 23-piece set will transport pirate lovers far away for hours of adventures on the high, high seas. The boat even rocks back and forth - hold on tight, matey! We'll see you soon, and enjoy the start to that most wonderful time of year!